Dekton* supplied and installed the flooring and staircase areas of the Star Hipotels, namely Playa De Palma Palace (a 4-Star hotel) and Gran Playa De Palma (a 5-Star hotel), in Mallorca, Islas Baleares. The two new hotels opened in 2017 with the goal of providing a modern, high quality establishment for foreign tourists. The hotels are in an excellent location and focus on offering a personalised service and a complete fit out of facilities and services that go far above and beyond market demands. The new hotels are expected to provide a major boost to the tourist economy and quality of the area. Connected by a convention centre, Hipotels Gran Playa de Palma has 368 rooms that are spread across six floors, while Hipotels Playa de Palma has 224 rooms spread over seven floors. Located only 200 metres from the beach, their facilities boast a wide range of services and amenities such as a terrace, indoor and outdoor swimming pools, bars, restaurants and a spa. For the execution and setup of both complexes, more than 72 700m² of the ultracompact surface Dekton by Cosentino and more than 1 600m² of Silestone by Cosentino were used. The ultracompact surface Dekton forms a large part of the paving material used for the interior and exterior flooring of both hotels. The large format of the Dekton pieces (320 x 144cm) enabled the design team to create a visually pleasing, high quality flooring installation in the bedrooms, common areas and the areas surrounding the outdoor swimming pool. Pieces of Dekton manufactured in smaller sizes form terrace flooring, en-suite showers, staircases, a 5-Star spa and a heated swimming pool. Its strength, resistance to abrasion and ease of maintenance made it the ideal flooring product for the project. The use of grip and anti-slip technology increases the safety level of the Dekton surface, preventing possible accidents. Dekton, thanks to its high resistance to hydrolysis, and therefore its excellent water-resistant qualities, is the ideal material for spaces with a constant water presence. Dekton does not change its composition or aesthetic in damp or wet environments, thus ensuring its durability and beauty. Opting for uniform colour, finishes in soft, pale and grey tones such as Danae, Blanc Concrete, Sirocco, Edora and Keon can be found throughout the project. 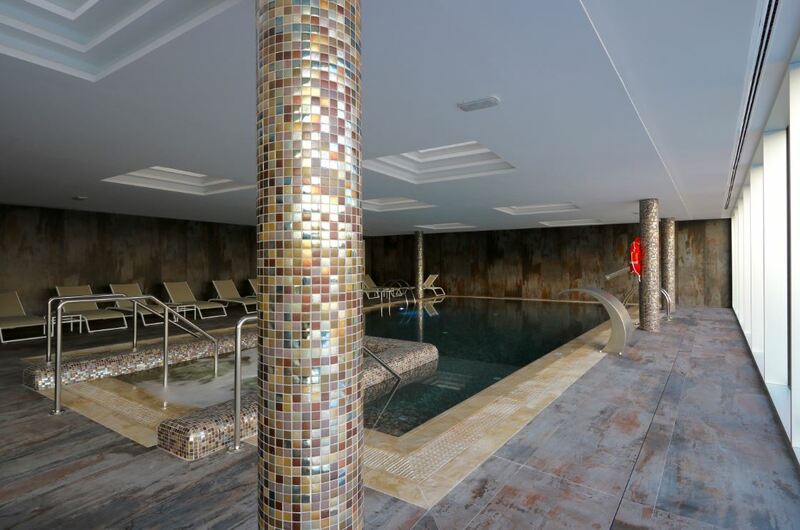 The brand new colour Trilium was chosen for the heated swimming pool. This colour offers a metallic, industrial appearance and is made with 80% recycled materials. More than 41 000m² of the company’s products were used in the flooring of these hotels. For more information contact Dekton on Tel: +27 (11) 974 8914 or via www.dekton.com.